A study by Oh et al. demonstrated non-inflammatory (no neutrophil invasion at 1, 2, 4 or 8 weeks) collagen bundle thickening at 8 weeks in the transverse carpal ligament rabbit equivalent after a single injection of 0.05 ml of 10% dextrose into the carpal tunnel equivalent (subsynovial space) through a small incision with a 30-gauge needle. Oh S, Ettema AM, Zhao C, et al. Dextrose-induced subsynovial connective tissue fibrosis in the rabbit carpal tunnel: A potential model to study carpal tunnel syndrome? Hand (N Y). 2008;3(1):34-40. This initial study was followed by three randomized, masked, two-arm studies which compared 10% dextrose versus normal saline. Single injection, Yoshii Y, Zhao C, Schmelzer JD, et al. The effects of hypertonic dextrose injection on connective tissue and nerve conduction through the rabbit carpal tunnel. Arch Phys Med Rehabil 2009;90:333-9, two weekly injections, Yoshii Y, Zhao C, Schmelzer JD, et al. Effects of hypertonic dextrose injections in the rabbit carpal tunnel. J Orthop Res 2011;29:1022-7, and 4 weekly injections , Yoshii Y, Zhao C, Schmelzer JD, et al. Effects of multiple injections of hypertonic dextrose in the rabbit carpal tunnel: a potential model of carpal tunnel syndrome development. Hand (N Y) 2014;9:52-7. Results were evaluated successively with findings measured at 12, 12 and 16 weeks after the first dextrose injection respectively. Energy absorption and load to failure of the SSCT were measured using a standardized approach. The three studies demonstrated consistent and significant increases in tensile load to rupture(figure 1), total energy absorption to rupture (figure 2) and thickening of the subsynovial connective tissue. 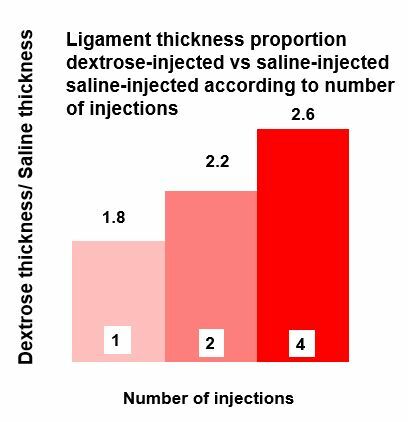 The proportional increase in ligament thickness with 1, 2 and 4 injections is seen in the figure above. All these studies were performed at the Orthopedic Research Laboratory at Mayo Clinic, in conjunction with the department of neurology. The goal was to make an animal model of carpal tunnel syndrome by thickening the carpal tunnel ligament (transverse carpal ligament), flatting the median nerve to create carpal tunnel. The author’s hypothesis that non-inflammatory progressive transverse carpal ligament (or equivalent in animal) proliferative thickening (fibrosis) will lead to eventual median neuropathy, is supported by these studies. It is important to observe that there were no inflammatory cells and dextrose concentration was only 10%, confirming that this growth was not a result of inflammation but rather was a result of a proliferative effect of dextrose without inflammation.